Many sporting events were held this year. From annual championships like the NBA Finals to quadrennial tournaments such as the FIFA World Cup, 2018 hosted a ton of competitions. Different sportsbooks set the odds of the teams and players joining these events even before the dates are scheduled. Most of the time, bookies’ predictions are accurate, but some of the matches this year begged to differ. 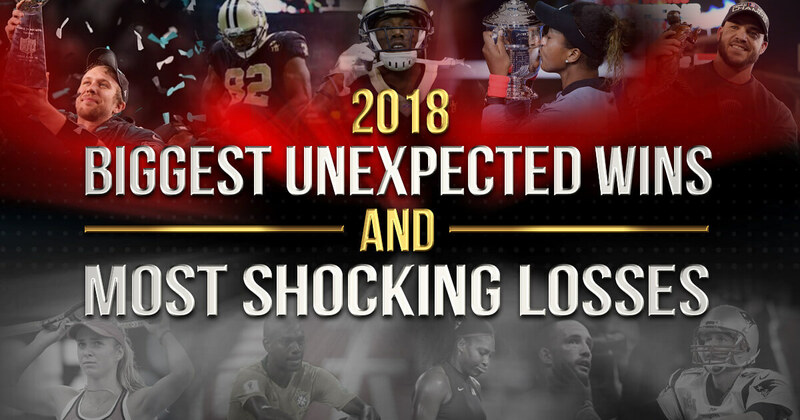 Here are some of 2018’s biggest unexpected wins and most shocking losses in the sports world. Philadelphia Eagles ended the 2017 NFL season with a bang last February by winning against the bookie-favored New England Patriots. The Eagles won against the Patriots with a score 41-33. During the semi-finals of the season, sportsbooks have already been giving predictions as to who will be the next champions. All bookies favored the New England Patriots. Bookmakers still eyed the Patriots as the soon-to-be champs with their Super Bowl match against the Eagles. Bet365 gave New England Patriots -200 odds and Philadelphia Eagles +170 odds, while Bethard favored the Patriots with -222 odds and set the Eagles’ odds at +195. The Eagles, however, did a fantastic performance during the match which led them to winning the title of Super Bowl Champs. The team’s quarterback Nick Foles gave his all with 28 out of 43 passes, one interception, and three touchdowns during the game. This led him into becoming the season’s MVP as well. In August of this year, both teams once again went head to head for Week 2 of NFL’s 2018 preseason. Before the match, the Eagles tweeted a picture with the uniforms of its players Jeremy Reaves and De’Vante Bausby in an attempt to remind fans and their opponent about the scores in Super Bowl LII. Reaves’ uniform was number 41 while Bausby’s was number 33. Before the start of the 2018 French Open, bookmakers have released odds of who were most likely to win the tournament. Bookies strongly favored Rafael Nadal and Elina Svitolina as the champions of this year’s Roland-Garros. 1xBet gave Nadal -277 odds of winning while William Hill set Svitolina’s odds at +550. Nadal was able to take home the gold by the end of the French Open. Unfortunately, Svitolina was eliminated even before she reached the semis of Roland-Garros. In June 1, the Ukranian player lost her match against Mihaela Buzarnescu. Svitolina had a difficult time chasing the ball across the court as Buzarnescu gave hard hits that sent the ball to the opposite side where the favored player stood. Buzarneszu won with scores of 6-3 and 7-5. Although the first half of Svitolina’s 2018 was rocky, she was able to win the WTA Finals against Sloane Stephens last October 28. The Ukranian player was able to gain a comeback against Stephens from a 3-6 to a 6-2 and another 6-2. Brazil stood as a favorite of many bookies when it came to which team will win the FIFA World Cup 2018. The sportsbooks bet365 and William Hill gave the Seleção +400 odds in taking home their supposed sixth World Cup title. A quarter-finals match against Belgium in July, however, turned Brazil’s chance of winning another World Cup championship into ashes. The Belgians won against Brazil with a score of 2-1. Brazil was in control of the first half of the match, but the Red Devils gained a one-point lead against the Seleção because of an own goal by Fernandinho. Nacer Chadli’s corner kick into the penalty area hit Fernandinho’s shoulder which went straight into the goal. Alisson Becker, Brazil’s goalkeeper, did not anticipate for this to happen which was why he was not able to block it. At the game’s 32nd minute mark, Belgium’s Kevin De Bruyne led his team to gain another point after scoring a goal against Brazil. The Red Devils were going on a counter attack which succeeded, leaving the Seleção in shock. The Belgians advanced onto the semi-finals after their win against Brazil. This was the first time they have entered the semis after their last semi-finals match three decades ago. Naomi Osaka shocked the world after defeating Serena Williams and winning the title of 2018 WTA US Open champion. Last September, Osaka became the first Japanese tennis player to win a Grand Slam title after beating Serena with 6-2 and 6-4 in the finals. If the finals match turned the other way around, Williams would have won her 24th Grand Slam title. Days before the match, sportsbooks have already set their odds which were in favor of Williams. 5Dimes gave Williams -294 odds and Osaka +260 odds, while Bethard set Williams’ odds at -286 and Osaka’s at +254. The finals match between both players sparked controversy with Williams’ attitude towards Carlos Ramos, the chair umpire of the match. Williams’ rage fit started in her second set against Osaka. Williams was later called out again by the umpire for smashing her racket after missing a shot. The veteran player received a point penalty which resulted to her shouting at Ramos. By the end of the match, Williams and Osaka hugged by the net with the 23-time Grand Slam champion congratulating the Japanese player. But, the game’s controversies did not end there as the crowd started yelling “boo” as Osaka was receiving the Grand Slam title. The veteran player, however, asked the crowd to stop and instead cherish the moment. Weeks before UFC Fight Night 138, bookmakers’ odds for the bout between Volkan “No Time” Oezdemir and Anthony “Lionheart” Smith were already set and all were in favor of No Time. The sportsbook bet365 set Oezdemir’s odds at -175 and Smith’s at +150, while bwin gave Oezdemir -189 odds and Smith +140 odds. The night of the fight, however, gave a different outcome as to who the bookies predicted to win. In October 27, Lionheart was able to beat No Time at the third round via submission. The main event’s first round started with Oezdemir taking the upper hand by giving Smith heavy hooks and body kicks. No Time still owned the second round by taking down Lionheart to fight on the mat. Smith even attempted a counter by aiming for a leglock on Oezdemir but failed as No Time slipped right through and started going for Lionheart’s back. Round three, however, did not work out well for No Time. Both fighters were on the mat with only a minute left on the clock. Smith went for Oezdemir’s back and tried his best to slip his elbow under his opponent’s chin. When Lionheart adjusted his grip, he was able to get the rear naked choke in, causing No Time to tap. After the match, Oezdemir suffered a broken nose, the same reason he was out a few months before this main event. No Time also said that he will be back as soon as he is cleared for fighting again. Boston Red Sox won their ninth MLB World Series title this year against the Los Angeles Dodgers. The Red Sox won with a 5-1 score on Game 5 at the home turf of the Dodgers last October. Before the game, the Dodgers had sportsbooks’ odds in their favor. William Hill and Bethard gave the Dodgers -149 odds and the Red Sox +129 odds. The results of the match, however, did not match up with these predictions. The Red Sox worked as a team that night which eventually led to their success. Steve Pearce, Red Sox’s left fielder and this year’s World Series MVP, was one of the players that pushed his team’s lead during the championship game. Pearce gave his all with two runs in Game 5. Chris Sale, pitcher of Red Sox, ended the game by striking out the Dodgers’ Manny Machado. Fans of the Red Sox were concerned as Sale had shoulder issues, but his winning pitch proved that he was feeling better. Los Angeles Rams were on a winning streak during the first few weeks of the 2018 NFL Season. In November, however, the undefeated team received its first loss in a game against the New Orleans Saints during Week 9 of the season. Several sportsbooks have already set the odds of winning of both teams, and the Rams were favored to win the game. Bet365 gave the Rams -132 odds of winning and the Saints +110 odds, while 1xBet set the Rams’ odds at -127 and the Saints’ at +110. The Saints brought their best during the game against the Rams which ended with a score of 45-35. Not only that, but the New Orleans team also had a couple of tricks up their sleeves as every time they scored touchdowns. Michael Thomas, Saints’ wide receiver, did a remake of the classic flip phone celebration right after scoring a 72-yard bomb. The stunt is a classic as it was first done by ex-Saints wide Receiver Joe Horn in 2003. Although Thomas performed a nod to the ex-wide receiver to celebrate, he was not the only Saints player who had a touchdown celebration. These are only some of the surprising happenings in sports this year. Punters should put in mind that not all the time will bookies’ predictions be right as anything can happen during the day of a sporting event. With 2019 fast approaching, it is likely that a lot more of unexpected results will come to pass.